I first discovered Arthur C. Clarke the summer before seventh grade, when I stumbled upon two massive Clarke anthologies in the junior high library. They were laid out like 60s vintage malls, with novels at each end like anchor stores and collections of short stories in between. Between them they were comprehensive, including his most famous novel, Childhood's End, never a favorite of mine, and The City and the Stars, which is. (A billion years in the future, an epic journey of discovery begins with a subway ride - what's not to love?) Among short stories they had "The Sentinal," the germ of 2001; the classic "Superiority;" and several Tales from the White Hart. Clarke was one of the SF trinity of the 1960s, along with Heinlein and Asimov, and he shares with Heinlein and Willy Ley the chief credit for the rocketpunk vision. 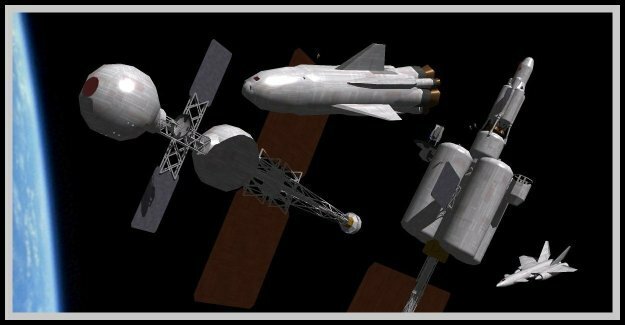 Thanks to 2001 he gave the rocketpunk vision its final form: There it was, up there on the the vastness of the screen, a huge spinning space station, hundreds of meters across, and a Pan Am shuttle doing its elegant docking waltz. In the real world, Clarke discovered the properties of the geosychronous orbit, which is why your satellite dish can point in one direction instead of slewing all over the sky chasing satellites. He popularized the communications satellite itself; indeed to the best of my knowledge he created the whole idea of geosats - the realization that looking back at Earth from the other side of the sky (and not just military spying) would be one of the most useful things we could do in space. Clarke was well ahead of his time in this. Of course he failed to foresee comsats and geosats as we know them today - like everyone else back then he never imagined satellites as we know them today. He assumed that complex orbital relay stations would be large structures with crews. In his classical arrangement there would be three of them forming an equalateral triangle around the equator, enough to give full coverage to the inhabited surface of the planet. The one over the South Atlantic was assumed to be the main one - serving as not merely relay but origin point for global news broadcasts, as well as presumably all the other classical functions of a space station. Instead we have hundreds of satellites of all sorts (and hundreds more defunct ones). Instead of a single global Third Programme we have scores of satellite broadcasts, satellite phones, GPS, and so on and so forth. In deep space we have explored as much as Clarke in his early days might have expected by this time; we have merely done it vicariously. Clarke's hard SF was as hard as it gets - never bogged down by the technology, but even more than Heinlein there was always a sense that he'd done all his homework. He had another side as well, semimystical or outright mystical. In The City and the Stars he took on the sheer, immense sweep of time, a billion years, and made you feel it. Sometimes his mysticism - which led him, in part, to live the second half or more of his life in Sri Lanka - also led him astray. Am I the only one who finds Diaspar, the city at the end of time, more appealing than hippie dippie Lys? Perhaps, though, Clarke sensed this; it is Alvin, from Diaspar, who reopens the way to the stars, not anyone from Lys. Now Clarke himself goes before us, beyond the beckoning stars.